Bella Hardware & Bath is a new decorative hardware and plumbing showroom located at 1096 Hendersonville Road. With 50 years of combined experience in the decorative hardware and plumbing industry, we take great pride in educating our clients' and meeting and exceeding their desires all while staying on budget. We believe strongly in growing the local economy, and supplying our clients' with green options that sustain a healthy home environment. From form and function to therapy, our product offering includes everything from steam showers to air and whirlpool baths, to the most amazing hardware for doors, cabinets, gates, shutters and everything in between. Yes, even the kitchen sink! Come in and be inspired. 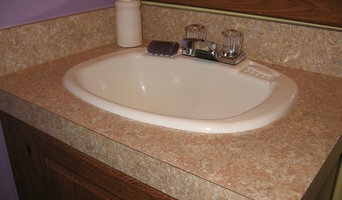 John's Kitchen Resurfacing is the place to call with all your questions for Kitchens and Bathroom remodeling. We are licensed and insured with over 20 years experience. From your countertops in either room to entire Kitchen and Bathroom resurfacing, let John's Kitchen Resurfacing help transform your home! 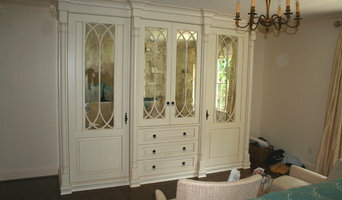 custom mllwork shop (woodworking) specializing in kitchen and bath cabinetry and custom mouldings. Welcome to Giving Tree Cabinets, your premier resource for custom cabinetry and woodworking. Giving Tree Cabinets is a completely custom cabinet shop that is locally owned and operated in beautiful Cedar Mountain, NC. I’m Steve Huter, and I have over 13 years of experience providing high quality custom projects at a fair price. As the owner and operator, I enjoy offering superb customer service and am completely involved from the beginning to the end of every project. Giving Tree Cabinets will help you design your cabinetry using materials that achieve your goals while staying within your budget. We use all wood boxes and solid wood faces to frame the construction of your cabinets. Please contact me today with any questions, or to discuss how Giving Tree Cabinets can help with your project ideas. Asheville Kitchens and Baths Inc.
Arrow Wood Products stems from four generations of Italian wood working. The company itself was founded in the early 1950’s, focusing originally on restoring fine heirloom and antique furniture. The craftsmanship and work ethic was referred to being as “straight as an arrow”, thus how the name Arrow Wood Products was conceived. The business was passed down from father to son, and the direction of its services has branched out; but the same love of working with wood and antiques and the pride of the workmanship has remained and is still strong today. Our home office is located in the beautiful mountains of Western North Carolina, just minutes away from the famously well known Biltmore Estate. We have a 60,000 sq ft workshop, which allows us to fabricate custom orders no matter how big and intricate or small and simple. This ample space means we can keep large manufacturing projects in house, allowing us to have complete control over the quality of the finished product. Our award winning design team will make your ideas and dreams come to life, and will guide you through all the details from start to finish- from dream to reality. and are able to convert your ideas into real world practical and affordable solutions/products. SMART home designs from Finland - making eveyday tasks simpler. I started my first woodworking business in Charlotte, NC in 1980. Since then I have resettled in Santa Fe, NM where I build custom furniture, cabinets and sculpture with a keen focus on sustainability. I have now moved on to Sugar Grove, NC just outside of Boone. The new business is Cove Creek Woodworks, 1171 US Highway 321 N,, Sugar Grove, NC 28679. Heritage Kitchens has served Western North Carolina for more than two decades, building long-lasting relationships with clients, architects, designers and builders through creativity, integrity and unparalleled expertise. Among their specialties are what they refer to as "the best values in custom hand-crafted cabinetry" by their team of talented craftsmen. They're also known for natural stone and quartz fabrication utilizing the best techniques that give you unmatched quality. As you might expect, outstanding referrals from clients, builders, designers and architects have proven a major factor in Heritage Kitchens' enviable business success. Use the Houzz Professionals listings to find Mars Hill, NC kitchen and bath accessory vendors. Don’t rule out asking a kitchen manufacturer’s design team for help, too. Skills often can be overlapped to save you time and money! Here are some related professionals and vendors to complement the work of kitchen & bath fixtures: Kitchen & Bath Designers, Kitchen & Bath Remodelers, Interior Designers & Decorators, Cabinets & Cabinetry. Find kitchen and bath fixtures and accessories, plus installation experts, on Houzz. Check out North Carolina kitchen products and installers, and bath plumbing products and installers, on Houzz. You can also look through project photos provided by Mars Hill, NC renovators, retailers and designers.